Time will tell whether this change will improve results for the community. Public input is more than asking residents their views; it must include some evidence that the public’s wishes for community benefit projects are reflected in the benefits negotiated on our behalf. In response to concerns raised in the community last spring over the process for negotiating community benefits in exchange for double the height and density on the Molinaro project on Brock and Elgin, I co-sponsored a staff direction to review the process to increase public input. That review resulted in a revised protocol for community benefits (also called “Section 37 benefits” for the relevant section in the Municipal Act). The revised protocol makes one change: to alert the ward councilor, who is then tasked with gathering community input on priorities. The section specifically states that “the ward councillor be consulted by staff prior to any negotiations with the applicant,” and staff are to provide the councillor with advice as to whether Section 37 benefits are appropriate and desirable; appropriate types of benefits; amount of benefits; and interests of the applicant. The protocol also states that any Section 37 development will be subject to the new development review cycle initiated last spring, also as a result of the Molinaro project. The new cycle effectively adds about three weeks between the first staff report on a development, which contains no recommendations; and the committee/council vote on a report, that does include staff recommendations. Staff reports are available about a week before committee meetings. So residents will still only have a week to prepare comments in response to the specific community benefits staff are recommending – same as before. That’s still not enough time for effective public engagement, so I will be looking for some evidence that the prior public input around community priorities shaped the benefits being suggested. 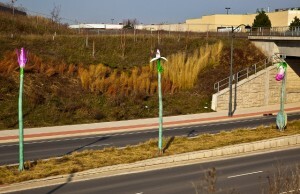 Orchid public art on Appleby: recent community benefits negotiated for extra height/density fund public art reserve. 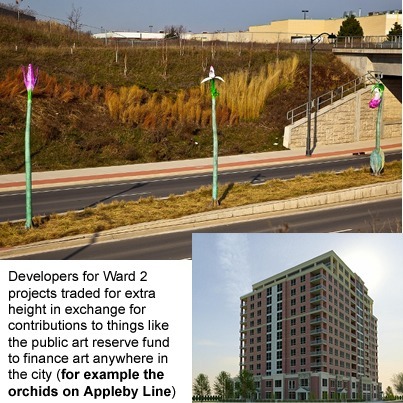 The old protocol (repeated in the new) stated community benefits are to be “high priority on site or near site” or “high-priority city-wide benefits.” While that is helpful, in practice we saw Ward 2 projects funding contributions to, for example, the public art reserve fund to finance art anywhere in the city (for example the orchids on Appleby Line). In my view, that violates the spirit of the protocol. There’s no guarantee that won’t happen again, unless we are vigilant. The protocol was approved by the Community Development Committee March 26, and needs council ratification April 10. To review the staff report on the development, click here. To read the revised protocol click here. To read the previous protocol click here. My Take: Though the commitment to consult with the ward councilor is a step in the right direction, time will tell whether this change will improve results for the community. Public input is more than asking residents their views; it must include some evidence that the public’s wishes for community benefit projects are reflected in the benefits negotiated on our behalf. Further, there remains concern among many residents (myself included) about the use of Section 37 to grant increased height and density at all. A review of the practice is overdue, though there is no appetite for such a review among staff or council at the moment. I am not in favor of allowing builders to overbuild on a small footprint in exchange for flowers. Re: new builds….green space around buildings and height restricted to existing limits. Marianne: This process for negotiating community benefits for extra density and height is totally unacceptable when planning decisions and height bylaws etc. are already in place. A developer should not be allowed a doubling of height or density by promising a few hundred thousand dollars for community projects. However, if this practise continues the funds should definitely stay within the ward. Again, this bribery for extra density is a total sham and council should be ashamed that they allow the practise to continue. I am glad that the Medica One project has lapsed and hopefully the project can be repositioned to your vision of low rise development . Semis, town homes, low rise should be the focus. No more “live work” concepts as these just compete for the few retail dollars that are downtown now. Another 18 storey building will knock out the last remaining bits of sunshine that we have downtown.